Everyone loves Instant Pot multi-function cookers, but not everyone loves their high price tags. If you’re looking for something just as good that costs about half as much, today is definitely your lucky day. 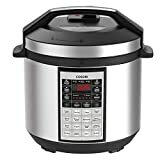 Amazon is running a great sale on the COSORI 6 Quart 8-in-1 Multi-Functional Programmable Pressure Cooker. It’s always a killer value at its normal selling price of $80, but a limited-time sale has dropped the price to just $61. Definitely do yourself a favor and check it out. 8-in-1 Multi-Functional Cooker: Pressure Cooker, Slow Cooker, Rice Cooker, Saute/Browning, Yogurt Maker, Hot Pot, Steamer & Warmer. Cook meals in mere minutes for your families, 4-6 people.Eight sous chefs in one machine, ready at a moment’s notice. Make meals up to 70% faster. 17 Smart Programs: Meat/Stew, Poultry, Soup, Beans/Chili, White Rice, Brown Rice, Multigrain, Steam Vegetables, Slow Cook, Yogurt, Pasta/Boil, Steam Potatoes, Hot Pot, Sauté/Brown, Bake, Reheat, Automatic Keep Warm. 3 adjustable temperatures for saute/brown, slow cook, hot pot and reheat. Everything You Need: 3-ply bottom stainless steel(18/8) cooking pot,stainless steel steam rack with handle, tempered glass lid for slow cooking,extra silicone sealing ring, ladle, rice spoon, measuring cup & Recipe book included! Certified Safety: ETL,UL,& FDA certified; 10 safety mechanisms provide peace of mind for beginner and expert chefs. Food-grade stainless steel (18/8) inner pot (with 3-ply bottom), lid, steam rack are easy to clean and dishwasher safe.